Tim and Dena Dority at Eagles Wings Quilts/Arizona Vac and Sew have been long-time supports of Project Linus Tucson. They opened Eagles Wings Quilting in Casa Grande, AZ on January 14th, 2010. They had one longarm quilting machine. As their business grew, they started offering more services, including a full array of quilting fabrics, notions, and sewing machines. 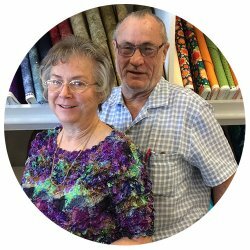 In theFall of 2011, Tim and Dena purchased AZ Vac and Sew Center in Tucson from Ron Sanchez, who has stayed on as a part-time sewing machine repairman. Tim and Dena have decided that it is time to retire. Project Linus Tucson would like to extend a huge thank you to Tim, Dena and their entire staff for their support of Project Linus Tucson. They opened their workroom to us so that we could have monthly Sit & Sew sessions. They have also been a drop-off location for blankets and quilting supplies. The Doritys have been a treasured partner to our organization, and they will be sorely missed. We wish Tim and Dena a well-earned and peaceful retirement full of Project Linus blanket hugs.